It’s a live recording (never the easiest thing to excel at), and after the hilarious self-introductory song (written by Grant), one can sense that the audience haven’t clocked the idea that they’re allowed to have fun. But their reserve doesn’t last to the end of the second item, Old Tyme Dancing written and made famous by the adorable Joyce Grenfell - you know the one - “Stately as a galleon I sail across the floor...” And by the time they’ve heard O Sole Mio (words by the barking Les Barker), they are helpless. 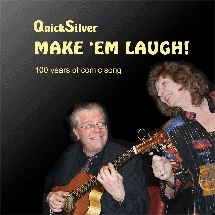 Subtitled “100 years of comic song”, this masterful CD is probably the best collation of comedy songs I have come across, and the performance standard is almost unbelievably high. QuickSilver are a duo of Hilary Spencer and Grant Baynham (Hg being the chemical symbol for mercury). Hilary has a nigh-flawless voice, and the control to go with it (having trained at Manchester Royal college of Music as a soprano). Grant is a recognised favourite of British broadcasting media, and worked for four years on Esther Rantzen’s “That’s Life!” series. His lyrics had all the agility of Noel Coward, and his fingers are equally nimble. The combination of these talents gives us a duo who sound confidently competent with material from sources as divergent as Jake Thackray and Gilbert & Sullivan. 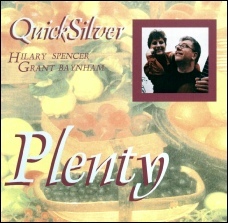 QuickSilver, who are Grant Baynham and Hilary Spencer proves that the unique breed of English music residing between Folk and Music Hall lives on. Not merely lives, but thrives. You may recognise Spencer’s name. She formerly was one third of the now-disbanded a cappella trio Artisan. QuickSilver gives her a much better opportunity to display her talent and personality. Baynham, whose previous musical endeavour was further outside folk wrote five of the thirteen selections on this CD and plays nimble classical guitar. Other compositions come from Lady Nairn, Jake Thackray, WC. Handy, Fats Waller and Andy Razaf, William Barnes and Ralph Vaughan Williams, Kern and Hammerstein, Flanders and Swann and even a poem by Ogden Nash set to music by Scot Brian Miller. Baynham and Spencer, who introduce themselves on the second track with a short humorous song, make a great pair. They have superb musical ability with plenty of personality. This is one of the cleverest CDs I have heard in recent memory. The expertly chosen material showcases them at their best. Most of it is intelligently humorous, one might say cheeky in British parlance. There a few serious tunes well performed, such as “Land O’ The Leal” and “Linden Lea” but for the most part this is a rollicking good time for the intellect. The wordplay in such songs as Thackray’s “The Kiss” keeps the head spinning. If you’re tired of the same ol’ same ol’, check out QuickSilver. They shine like mercury and are equally fluid. This release exceeded even my expectations., and I had a good idea of what to expect from consideration of the extremely talented participants ( Hilary Spencer - she of Artisan - and her cohort, “That’s Life!” veteran Grant Baynham, respectively vocalist and guitarist of unbelievable dexterity). Versatility is the keyword, as the duo are equally adept on a staggering variety of material that ranges from deeply serious to seriously silly and encompassing all points in between. The light-hearted probably has (just about) the lion’s share here, but that’s not a criticism. So finally - why QuickSilver? Aside from the aptness of the word to describe the duo’s wit and dexterity, the alchemists among you will have already sussed out that H+G (Hilary + Grant) = Hg, the chemical symbol for mercury which also goes by the name of - you guessed it - quicksilver. What really irritates me about ‘Plenty’ is the absurd mastery of whatever genre these two choose to take on. While the crest of us struggle to hoe our own row Grant and Hilary are the most varied of market gardeners. Not only brassicas but courgettes, leeks, peppers, red and green. One could almost imagine them with some small livestock. Maybe even an emu. . .
. . .sorry, but the versatility on display here is stunning. And the trick they’ve pulled off is that these are not pastiches. 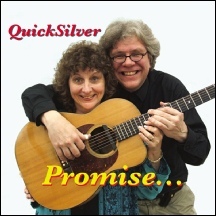 QuickSilver convince equally as folkies, chansonniers, or jazz/blues comedy-lieder yodellers. You can’t pick a favourite from such a rich album, but I’ll mention some of mine - Mad Dogs And Englishmen (Noel Coward), Madeira M’Dear (Flanders and Swann), If It Wasn’t For The ‘Ouses In Between (Bateman and Le Brunn), The Elements (Tom Lehrer and Arthur Sullivan), Let’s Do It (Victoria Wood) and The Cauliflower Song (Grant Baynham). The whole CD is a tour de force by two of the most talented performers in the kingdom. Three cheers for QuickSilver! Hilary, thank you very, very much for sending the CD. I’ve played it through twice and I think it’s absolutely wonderful. My favourite so far is the one about the houses in between - I really, really like that one but I think your rendition of Victoria Wood’s song at the end is amazing! I didn’t realise what a good song it is and I think you really bring the best out in it. I hope you do really, really well with it.